“Coke vs. Pepsi in Space” sounds like a bad sequel to a film about the Cola Wars. In the summer of 1985, this concept became a reality when the two soda brands reached peak rivalry by taking their beef into outer space. The year before, Coca-Cola had struck a deal with NASA to allow astronauts to test their new Coke can, which was designed for zero gravity on a shuttle flight. Carbonated drinks had yet to reach orbit because, at the time, there wasn't a container capable of dispensing soda in weightless conditions. When Pepsi caught wind of the project, they immediately got to work on developing a special can of their own and fought to be included. After weeks of legal negotiations, a compromise was reached that stated the shuttle Challenger’s pantry would be stocked with both beverages during a week-long mission in July of 1985. Coke's space-can technology cost $250,000 to make and used a special nozzle and valve switch atop a 12-ounce can to dispense the drink. 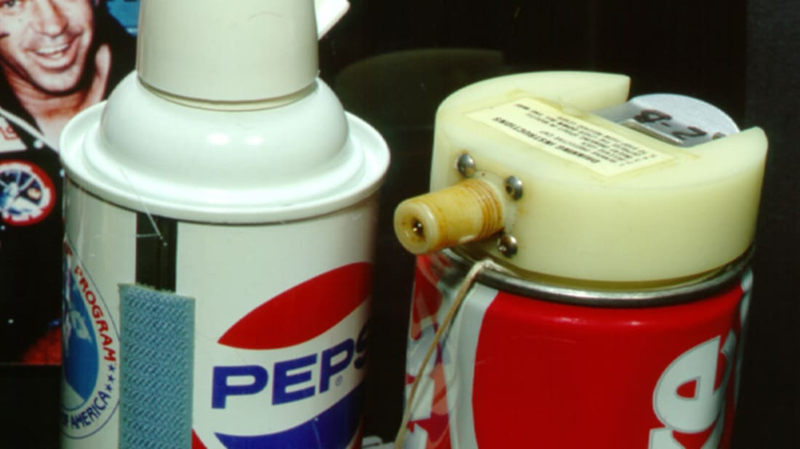 Pepsi’s technology also used a standard can with a dispensing valve, and cost the company $14 million to develop. The astronauts reported mixed results and neither product became a pantry staple on the shuttle. Even though NASA invited other brands to develop cans of their own, space still remains the final frontier in the battle for cola dominance.